1. Line two 1/2-cup coeur a la creme molds or two 6-ounce custard cups with double thickness of dampened cheesecloth, extending far enough beyond edges to enclose filling completely. 2. Combine 1/4 cup whipping cream, cocoa and butter in small saucepan. Cook over low heat, stirring constantly, until smooth. Remove from heat; cool. 3. Beat cream cheese, powdered sugar and vanilla in small bowl until smooth. Add cocoa mixture, blending well. Add remaining 1/4 cup whipping cream; beat until well blended. Spoon mixture into prepared molds. Fold cheesecloth over top. Place a wire rack in a tray or deep plate; place molds on rack. 4. Refrigerate 8 hours or overnight. To serve, pull back cheesecloth and invert each mold onto a chilled dessert plate; carefully remove cheesecloth. Serve with STRAWBERRY SAUCE. 2 servings. 1. Puree 1 package (10 oz.) frozen strawberries in light syrup, thawed, in food processor bowl or blender container. 2. Strain puree through fine sieve into small bowl. Stir in 1 tablespoon kirsch (cherry brandy), if desired. About 1 cup sauce. 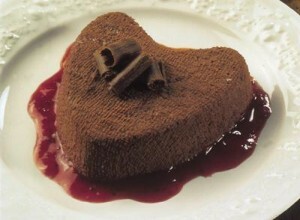 This entry was posted in Dessert - Eat dessert first, Life is uncertain and tagged chocolate. Bookmark the permalink.